When Billy (Vince Vaughn of Wedding Crashers) and Nick (Owen Wilson of Wedding Crashers) lose their job selling watches, they must find another gig in this new digital age. They are about 10 years too late on that, but being late to the party is what these characters bring to the table. I have to say that I identify with these guys. I mean, I have grandkids that Instagram me from the womb. The two 40-somethings bluster their way into an internship at Google, and the hilarity ensues. They do oversell the obsolete thing with references like a William Holden movie made 17 years before Billy was born. You see most of the laughs coming, but these two are so likable even the Google geeks take a shine to them. Directed by Shawn Levy (Night at the Museum), the movie strikes a good tone and balance between lessons and levity. All the things you want with a nice studio PG-13 movie. I am not saying the movie needed to be raunchy, but a little less predictable and safe could have elevated the entire piece. For example, Google comes out of this movie unscathed. At the end, I felt I’d been sold Google as a nice fun place to work instead of a nosy corporate monster from George Orwell’s (Nineteen Eighty-Four) worst nightmare. This is not a top shelf comedy, but it is a nice date movie. 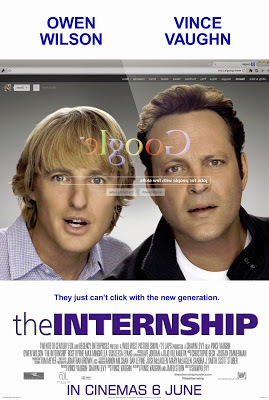 And if that is what you are searching for, then Google “The Internship” and you will find out I gave it 3 out of 5 stars. And I do want to say that I love Google and it is a great company and you should buy their stock and only say good things about them.